Country and blues music has always mined the life’s mundane moments and extracted nuggets of domestic mythology shimmering with love, lust, booze, blood, tears, asphalt and diesel fuel. With these elements masters like Hank Williams Sr., Neil Young, Townes Van Zandt and Bob Dylan – and latter day troubadours like Bruce Springsteen, Steve Earle and Chris Knight – transcend whatever genre they are bridled with and forge minor pedestrian masterpieces. This second solo release from Sioux City, IA’s Mat D (Mat deRiso) draws from the same humanistic sources. Assuming a more Americana tone than the country-rock his Profane Saints offers, Plank Road Drag works a well-worn sonic landscape but still manages to uncover many dusty gems. Resurrection Cadillac, the album opener is bathed in the sanctified blues of Leadbelly and Lightnin’ Hopkins as it lurches forward like a revved-up version of Led Zeppelin’s back-porch stomper Black Country Woman. Doomed romance continues with Cannonball as family plight and hardship runs as rough as their path toward Texas. Three A.M. refuels the dirt-floor romance, gliding like a fever-dream vision of trailer-part trysts. 40 Watt Moon is the fever aftermath recounting beautiful memories and empty bottles. The album closes with the bluegrass-tinted title song, where Mat d uses hillbilly poetry that could easily be inspired by watching the Coen brothers’ O Brother, Where Art Thou? with the sound down and Guy Clark on the turntable turned way up high. 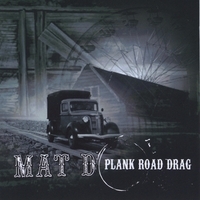 Mat D’s Plank Road Drag is an ambitious record that hits on all cylinders to set a high water mark for any other contender for this year’s album of the year.